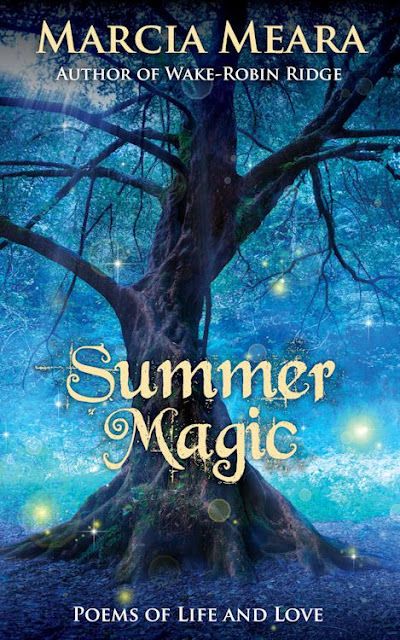 I couldn't resist the awesome cover Marcia received for her volume of poetry Summer Magic. Marcia is blogging at The Write Stuff. She writes poetry and fiction. An energetic person, full of positive thinking, radiating kindness and wisdom she is a supporter of other authors. Thank you so much for sharing my beautiful new cover. When I've finished expanding the book a bit more, and formatting for print, it will be available at amazon.com. I'm excited to be working on some new poems, especially for this "edition." I appreciate your telling your followers about it, and about The Write Stuff, where you are such a valued member! You are most welcome. Marcia! Poetry is what I wrote at first and sometimes I think I could try my hand at it again. I enjoy your poems that you post from time to time on your blog. WOW! What a stunning cover. That is absolutely gorgeous!! Yes, isn't it? Like a fairy tale. after all it's Summer Magic. Thank you for stopping by, Mae!